How To Burn Calories Through Cleaning! Good news! Housework, cleaning, DIY and gardening all burn calories! The more vigorously you do it, and the longer you do it for, the more calories you will burn. The thing to remember is that we are ALWAYS burning calories, whether we are walking, standing, sitting or sleeping. It's the rate at which we burn calories that changes with physical activity and exercise. So if you struggle to find time to go to the gym and keep your house spick and span, rest assured that even the most mundane bed-making can help your daily calorie burn. Here's why and how those everyday chores can really count. Household activities are not generally classed as exercise because it is considered that the main purpose and outcome of 'exercise' is to positively impact an individual's fitness. 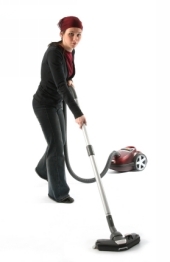 The main outcome to household work is a cleaner house, with health and fitness benefits coming as a bonus. This is the main reason why activities like cleaning, DIY and gardening fall under the category of 'physical activity' as opposed to exercise. Start making these physical activities a regular, even daily, occurrence and try to really up the intensity when doing them. Turn your favourite music up full blast to get you dancing around and getting really stuck in as you clean. And make sure you run up and down the stairs as you move around the house. This will not only give you a super-clean house in extra-quick time, it'll be possible to achieve valid fitness benefits similar to exercise! Try to compliment any physical housework with focused exercise to target cardiovascular fitness, muscle development and joint strength.